Mike Pence is the 50th Governor of Indiana. He was chosen in 2016 by Republican presidential nominee Donald Trump to be his running mate for Vice President. Mike Pence is a lifelong Hoosier. He’s a conservative and supporter of the Tea Party movement. 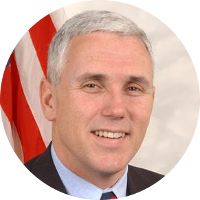 Prior to politics, Mike Pence worked as an attorney and was the president of the Indiana Policy Review Foundation. He was also host of The Mike Pence Show which was a talk radio show in Indiana. With most of his family tree leading to fairly recent Irish and German immigrants, Mike Pence currently has no known famous kin. However his Pence ancestral line currently has a few brickwalls on it. This line reportedly leads back to Michael Bentz (family surname later changed to Pence) who was born circa 1705. If correct, this line may lead to some famous kin. There is a book published in 2013 at the Indiana State Library in Indianapolis by Betty L. Warren titled Genealogical Information of the Pence – Cawley Ancestors. It is a genealogical history of the paternal and maternal ancestors of Gov. Mike Pence. This book may include additional ancestors for Mike Pence. Unfortunately, the Indiana State Library has the only copy in a library according to WorldCat.